Good Morning and Happy Tuesday! 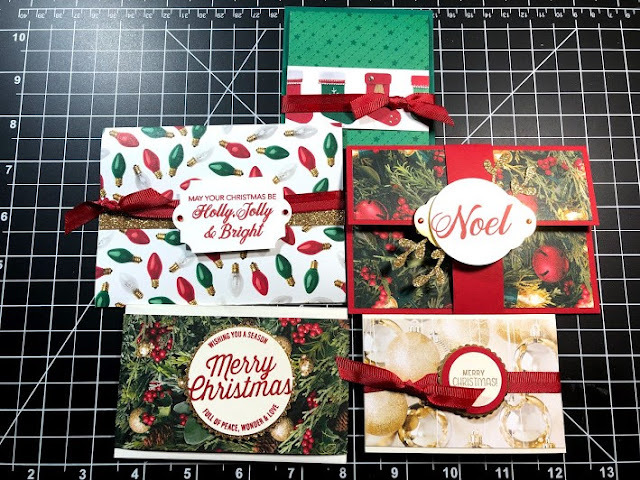 I wanted to take a quick minute to let you know about my upcoming Gift Card Holder class that is fast approaching the deadline for registration. And yes, this class is available to go as well! The cost of this class is $25 and includes a full pack of the All is Bright Designer Series Paper. For the To Go option, add $13.65 for shipping the materials to you. To register for this class by tomorrow, 11/21/18, click here and I will send you a PayPal invoice for the class fee. The live class takes place, Wednesday 12/5/18 at 6 PM EST at LaRoma's Pizzeria 3 Harden Blvd, Camden, NY 13316. The To Go kits will mail out on Saturday, 12/8/18 or sooner via Priority Flat Rate box. Why not present those gift cards in a fun and festive manner?